Oblong/rectangular, dart, contoured, or half-moon? Carbon fiber, wood, foam, or plastic? Most violinists only need to carry around two bows, so many cases made currently no longer offer the four bow holders in an effort to save space. Manufacturers have also realized there is a need for more compact cases as airlines are really clamping down on carry on sizes. Many musicians complain that despite the airline rule of allowing a violin on board, when they proceed to the gate, flight attendants try to say their case is too large. In this guide you’ll find cases suitable for travel, lightweight, traditional, “cool” looking, and budget-friendly. There is something for every taste and style in this violin case buying guide. Will the violin stay at home most of the time or be on the go? There are cases made to fit any budget, ranging in price from about $20 for a very basic model to upwards of $1,000 for a handmade lightweight case. 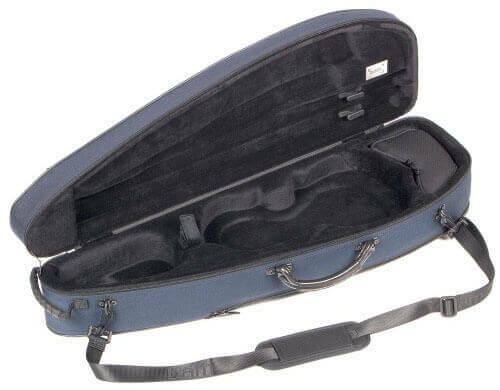 Most cheap beginner violins come with a standard, basic case. 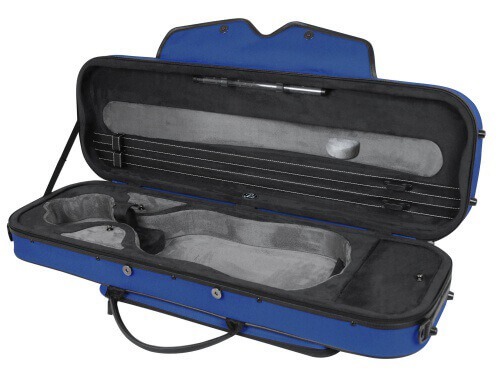 When it is time to buy a higher quality instrument, a better quality case should be purchased at the same time. Protecting your investment with a good, solid case is vital. 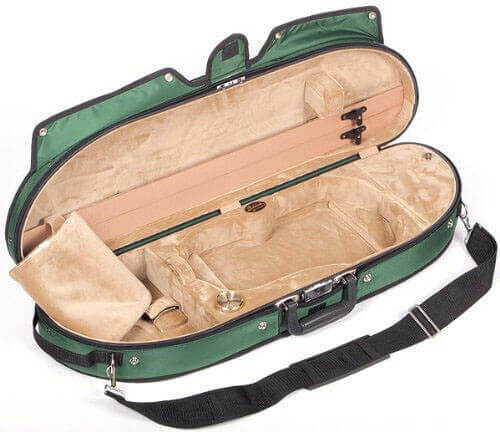 The shape of the violin case relates to the amount of storage space available for extras, including rosin, mutes, shoulder rest, and extra strings. An oblong or rectangular case will have more space, with space for up to four bows and holding all extra accessories. Music is also easily stored in the side pocket as it is usually a large enough pocket. A contoured or half-moon with not have as much space, and typically can only hold up to two bows. Sometimes there is not even space for a shoulder rest or any music, which can be very inconvenient. Some cases such as the Tonareli and BAM brands sell a separate music bag that can be attached to the case. Otherwise carbon fiber/fiberglass models do not have any music storage available. There are a wide variety of materials used for both the outer and inner shells of the case. Plastics and ABS, carbon fiber and fiberglass, or wood and wood laminates are the materials used for the outer shell of most cases. The newest trend in cases are the carbon fiber and plastic styles. Many players opt for these cases because of the more modern look, suspension technology, compact size, and lightweight characteristics. While these more modern cases claim to protect just as well as the traditional wooden cases, there is some evidence to support that a wooden case can protect just as well or better. Some wooden cases are about the same weight as a synthetic material case and also offer suspension options. When choosing a carbon fiber or ABS-type case, you will also want to consider if you need to buy a cover for it. Living in colder or rainy areas requires a weatherproof case cover. The Cushy or Mooradian are universal to most standard-sized cases, while companies such as BAM and Tonareli offer their own particular version to fit their cases. Make sure whichever case you choose the fit is correct. Most violins will fit in most cases, however, if your violin deviates too much it may require a custom case. Cases usually have a velcro strap or tie to secure the violin neck into position. The part surrounding the violin should be soft yet hold the violin still in place. 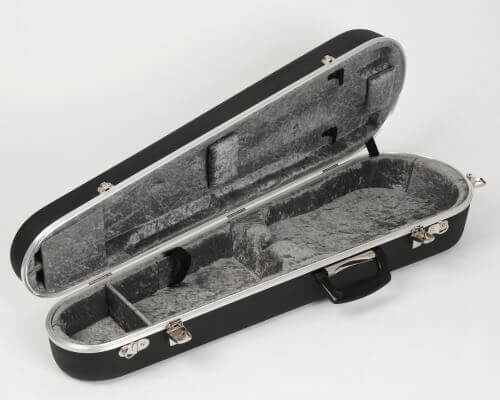 Some violin cases offer suspension, which means that if the case is knocked or hit, the violin will be protected inside. 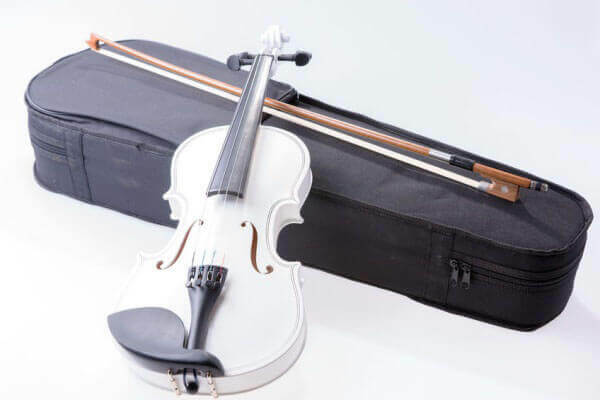 Extra features include the number of compartments inside the case, the number of bow spinners (holders), tube for extra strings, room for a shoulder rest, and a built-in hygrometer. The hygrometer measures the humidity in the environment. It is not necessary to have a built-in one, there are other options such as the Dampit humidifier to put into the case. If you like to keep your music in your case most of the time, some cases have a zippered pocket, while others do not. Music bags can be purchased for certain fiberglass cases to attach. As stated earlier, the more valuable your instrument the more you will want to protect it. A beginning student may just accept the case that comes with the violin, usually a foam or wood laminate one. Advancing students who purchase a more expensive instrument should then choose a case that fits their needs better than just a basic one. 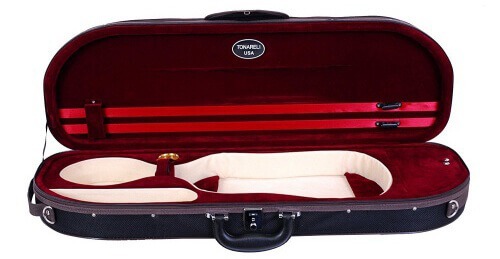 Be prepared to spend $200-400 for a quality case in the advanced to professional range of violin cases. Top of the line cases are closer to $1,000 for the serious musician who owns an exceptional violin. If you are constantly on the go and travel by foot and public transit, it would be best to have a case that fits that type of lifestyle. Backpack straps and a protective hard case with room for carrying music would be ideal. For players who travel by car and don’t carry their instrument too far, a less compact and slightly heavier case type will work. 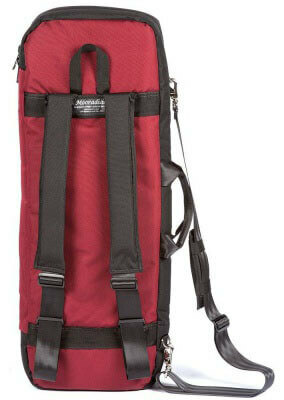 Many cases come with several carrying choices: backpack, over the shoulder, subway strap to hold vertically, and a handle. The weight range of cases is about 2 pounds up to about 7 pounds. This doesn’t sound like a lot, but if you plan to add music to your case and you are carrying the case for long periods it is better to buy a lighter case when possible. Another factor to consider with size is how often you plan to travel by plane with your instrument. Regulations are much stricter in the past ten years about carry on luggage. 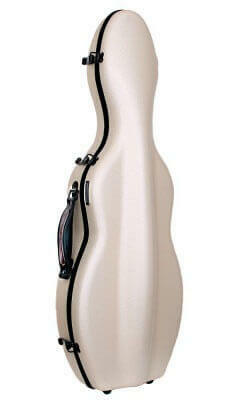 Choosing a cello-shaped case such as Tonareli or large oblong case is not as easily taken onto a plane. BAM makes a compact case that does not hold a bow that will fit very well into any overhead compartment. The main drawback is that a bow case must be bought and carried alongside the case. Some violinists choose to show their personality with the choice of case. Nowadays with carbon fiber and plastic versions, almost any color is readily available. These cases can also have stickers easily applied to add even more flair. Pedi Designs offers colored cases, but most Cordura cases come in neutral black, tan, or navy. If you want a BAM case that is quality but a lower price than the ABS models, the Classic is a great pick. At around $250 you can get the quality standard and a compact size which is great for travel, too. The Bobelock brand is a solid one with many options. The half moon is a slightly smaller case, watch out, it is quite heavy as far as modern cases go. It offers good protection for a very small price tag, just under $200, so it is a bargain for the quality of case. The “Puffy” version comes in a few other colors such as purple, pink, and bright blue. The name refers to the insulated cover that offers better protection than the regular version. 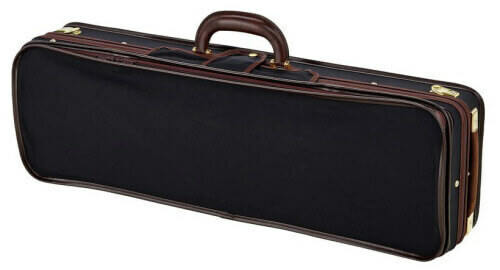 Hiscox Cases make a traditional hard, black case for all types of instruments, not just violins. Their cases are very sturdy and withstand a lot of wear and tear. There are two styles, a rectangle (oblong) or dart shape. They have a very basic look to them, so this is about as traditional as you can get. Mufasia makes the ultimate in violin cases. Handcrafted in Italy, they bring case-making up to the level of the intricacies of violin-making itself. These cases are for professionals who need to protect their precious, valuable instruments. The protection is second to none, and while the price is high, this case is built to last. This oblong model has a very secure backpack hold that is great for violinists who travel a lot by foot. It is priced just under the BAM Classic, so it is possibly a little overpriced in comparison. An unusual shape, fiberglass and just 5 pounds, the Aileen is a stylish case for a small price. The downside is that the inner compartments are quite small and some violins may not fit in this case. At 3.5 pounds, this is one of the lightest cases with excellent protection. 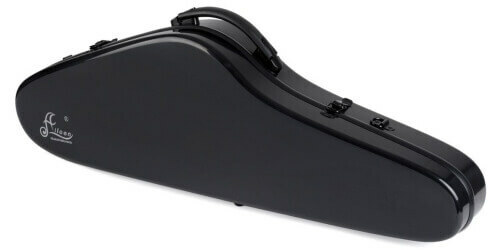 BAM Hightech Slim is probably the best lightweight violin case you’ll find. 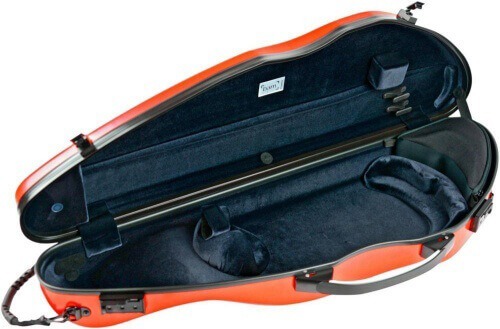 It is also in the “Best Travel Violin Case” category as it is a very sleek and small design. 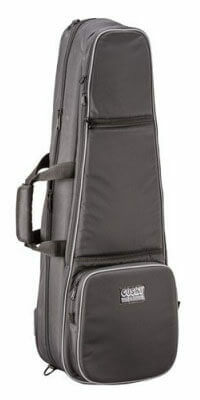 At the high-priced end of lightweight cases, the dart-shaped Mufasia “Master” is just over 5 pounds but offers the best protection for a valuable instrument. At just 3.4 pounds and just over $100, this is a great case for someone who wants a classic-looking quality case but without the price tag. BAM – one of the first companies to manufacture ABS cases, these are some of the most durable and well-made cases on the market. There are many “copycat” cases that are made of a fiberglass shell, not carbon fiber. The difference is that carbon fiber and ABS is a stronger substance than fiberglass. BAM is the industry standard, and therefore the best in terms of a synthetic-material case. Also in the best “cool” looking category, the Accord is a mold in the shape of the violin, so it is a smaller surface size than a traditional oblong case. The price tag is a little on the steep side, when you can find a BAM for less. Accord offers some unique marble-effect colors, so if you like to make a splash, this is your case. Accord “Soloist” is probably the best violin case for travel, if the money is no issue. Made in a teardrop shape with the regular protection of any BAM case, the one drawback is that there is not a space for a bow. A bow case must be purchased to carry alongside the violin case. However, for those who do a lot of traveling, you won’t have to worry about anyone hassling you to bring this size case into an overhead compartment. 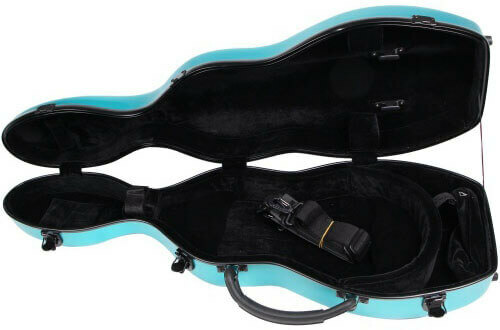 At just $80, this is a great case for a younger student with a less expensive violin. As with cases that come in this unusual shape, it cannot always fit shoulder rests inside and may not fit all violins well. A knock-off of the Tonareli case, again, it is a fun case to have for a student, but it is recommended to spend a little more for better protection and violin fit. 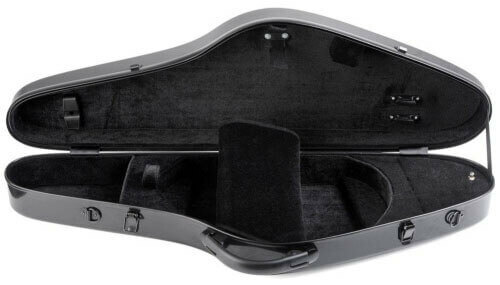 This cheap violin case (at around $20) is perfect for a student instrument. It is very lightweight at just over 2 pounds, and does not offer very much storage. 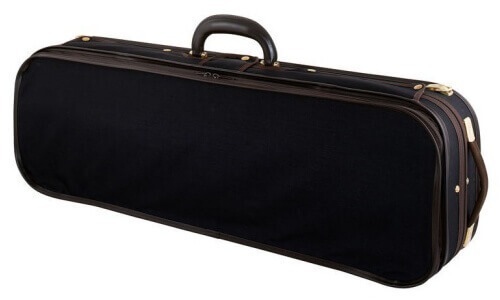 It might be the best cheap violin case for an instrument that mostly sits around the house as it does not offer a lot of protection from weather or shock. You’ll definitely stand out with the Tonareli cello-shaped violin case. Available in 21 bright colors and the bold shape, this is a version meant to compete with the unusual shapes and colors of BAM cases. Some violins may not fit very well in the Tonareli case, so it isn’t for everyone. Depending on the type of case you already have and the climate where you live, some cases need an added layer of protection. These covers protect from rain and cold weather climates. The Cushy and Mooradian add more storage space and very sturdy backpack straps. Cushy covers are made for oblong or dart-shaped violin cases. The thick foam material protects and insulates your instrument. Will fit most standard-sized modern violin cases. Mooradian covers are available in green, burgundy, or black. They offer all-weather protection for your case, both oblong and dart shapes. The price tag is quite high, but offers good protection. BAM offers a “hoodie” option for its Hightech case, in seven colors. 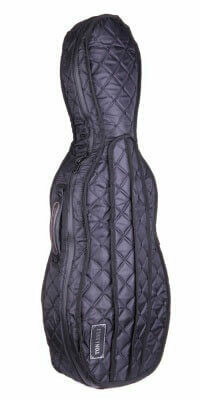 It is weather resistant with a cool-looking quilted exterior. Tonareli has a cover available for its cello-shaped violin cases and the oblong fiberglass. The look is similar to the BAM quilted cover. 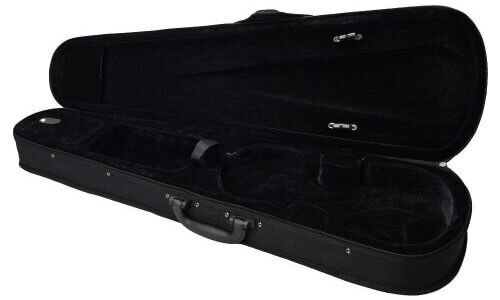 These violin case reviews are just the tip of the iceberg, as there are a plethora of violin case brands available from retailers all over the world. Do you require more or less storage? A lightweight, easy to carry case? Or a lot of protection but compact enough for air travel? These are all important considerations. Ask colleagues, teachers, and friends what case they recommend and prefer. Go to a local violin shop to see, touch, and try different cases before making your decision. For the beginning student, a basic case is usually included with the instrument and no additional decision is necessary. For the advancing player, a case is an important investment for protection. Professionals know the importance of a case and buying quality craftsmanship. No matter where you are on the spectrum, hopefully this guide has helped you think about your needs, budget, and style to give you a more informed decision when the time comes to purchase a new violin case.